The splendid Biltmore House is the largest privately owned home in America. It took 1,000 workers 6 years to build. It's 250-rooms include 65 fireplaces, 34 bedrooms, 23 bathrooms, and 3 kitchens. It has a 102 step massive stone staircase, and in its center is an iron chandelier containing 72 electric light bulbs. The great hall is 74 feet by 42 feet and has a dining table that can seat 64 guests. Many of the original furnishings have been carefully preserved and the house is filled with priceless art treasures Mr. Vanderbilt collected throughout this world travels. This historic mansion brings the enchanting Gilded Age in America to life. Guests are invited to share the American Dream and "imagine if this were home". The spectacular Biltmore Estate Gardens offer visitors an opportunity for leisurely strolls through a world of garden paths and reflecting ponds. The gardens are adorned with a great variety of lush plants and beautiful flowers. A four-acre Walled Garden and an adjacent Conservatory are part of this 75-acre garden beautifully landscaped to blend harmoniously with the surrounding woodlands. The Biltmore Estate Winery offers self-guided tours. Visitors learn about the history, science and the fine art of winemaking. Hosts in the Tasting Room serve visitors samples of the grape juices and wines made from grapes grown in the Estate Vineyards. 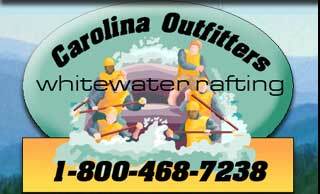 Located just 60 miles east of Bryson City in Asheville, N.C. Open 9:00 AM-5:00 PM. Closed Thanksgiving & Christmas Day. For Biltmore Estate tickets call Carolina Outfitters at 1-828-488-6345, or you may purchase tickets at our office when you check in for lodging or rafting.